If you’re looking for a taste of Britain in the heart of Savannah, don’t miss Six Pence Pub. The city’s most authentic and friendliest British pub serves up an ideal combination of beer and cider on tap from the United Kingdom, plus homemade favorites from “across the pond” like Shepherd’s Pie, Scotch Eggs, Beef Guinness and Bangers and Mash. Conveniently located on Bull Street, just steps away from Liberty Street in the heart of Savannah’s National Landmark Historic District, this British gem offers indoor and outdoor seating and a full menu, served until midnight. Six Pence Pub delights visitors from near and far with outstanding British-inspired food and drink. Savannah’s original and most authentic British pub proudly offers the best of the U.K. in Georgia’s First City. Savannah’s founder, English general James Edward Oglethorpe, would be right at home at this traditional, family-friendly British pub and restaurant. However, patrons with all-American taste can also enjoy juicy hamburgers, stuffed sandwiches, pot roast and pork roast at this beloved neighborhood pub. Enjoy lunch, dinner or late-night dining in a cozy, congenial atmosphere. Or, choose the sidewalk dining for a perfect place to “people watch” while sampling a variety of appetizers, traditional American and British comfort foods. The sidewalk tables serve as an ideal place to enjoy a pint and a meal al fresco—plus, it’s a great place to bring your canine friends! The full bar, which offers an impressive array of imported beer, wine and liquor, is open daily, with Happy Hour from 5 to 7 p.m. Stop by for a pint of Guinness, a glass of hard cider of the best martinis in Savannah! Settle into the pub’s cozy interior for a delicious lunch or dinner or to enjoy a favorite craft or seasonal beer on tap. Six Pence Pub has been featured in the pages of Southern Living, served as a key location in the Julia Roberts movie “Something to Talk About” and remains a popular downtown Savannah hangout for locals and visitors alike. Look for the Union Jack flying out front and the old-fashioned red telephone booth on the sidewalk outside and you’ll discover the best of England in Savannah. This popular dining destination offers a full menu throughout the day and into the late night. 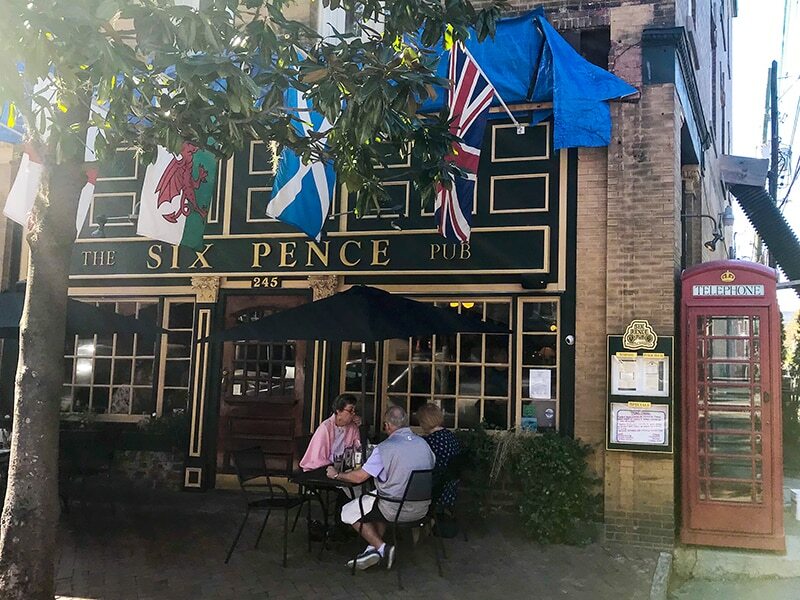 If you’re looking for a run, welcoming place to relax with friends over a pint or some traditional American and British food, stop by the Six Pence Pub. Don’t miss all the fun! Six Pence Pub is located at 245 Bull ST. Hours of operation are Monday through Thursday from 11 a.m. to midnight and Friday and Saturday from 11 a.m. to 2 a.m. For more information call (912) 233-3156 or visit sixpencepub.com/savannah.